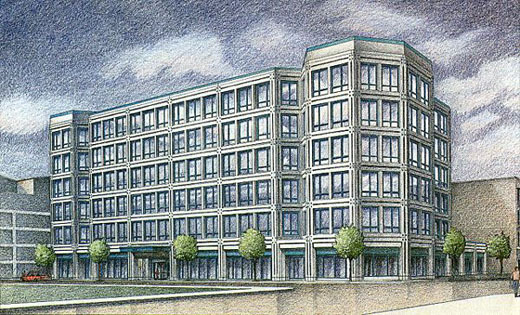 Randal was contracted by a graphic design firm in the 1980’s to create this architectural illustration. The design firm was commissioned by the building developer to design printed materials to attract an anchor tenant to a new commercial office/retail building in Chicago’s River North area. This building is still located at the northwest corner of Kingsbury and Orleans. Randal worked from the architectural blueprint drawings to create a 3D perspective wireframe model of the building. Once a viewpoint was agreed upon (looking northwest from across the street on Orleans), the linework was transferred from the 3D software, into 2D vector software like Adobe Illustrator. After cleanup and final linework was completed there, it was printed with a large format digital plotter on rough drawing paper. Randal finished the illustration by adding the color, values, and textures using color pencils by hand. The 20″ x 30″ artwork was then drum scanned and inserted into the designer layouts and printed in 4-color offset printing process. Several smaller detail illustrations were done as a part of this project in the same manner and style: a closeup of the building entrance, and the main lobby. The intended goal was reached… the final printed piece and their marketing efforts landed an anchor tenant!